Now fully updated in order to make your language learning experience fun and interactive. It's possible to still make use of the great benefits of a top language teacher and our many years of teaching experience, but now with added learning features while in the course and on the internet. The course is structured in thematic units as well as emphasis is placed on communication, therefore you effortlessly progress from introducing yourself and in front of everyday situations, to using the phone and having a debate about work. Next to the end of this course, you can be at Level B2 belonging to the Common European Framework for Languages: Can get connected to a higher level of fluency and spontaneity in which produces regular interaction with native speakers quite possible without strain for either party. One, five and ten-minute introductions to key principles to find started. A lot of instant give assistance with most popular obstacles and quick things to consider success, depending on author's many years of experience. Easy-to-follow building blocks to provide you with a clear understanding. Simple to find and learn, to set up a solid foundation for speaking. Read and then determine everyday dialogues to work with you speak and understand fast. Don't appear to be a tourist! Perfect your pronunciation before you go. Tests ever invented and on the internet to keep up with of your progress. Unit 6: Let’s go out! Unit 14: Come to see us! Unit 16: Let’s rent a car! Unit 17: Let’s learn something new! Unit 20: Did you know that...? Mare Kitsnik is simultaneously a freelance teacher of Estonian as a second language and a freelance author of Estonian study materials and training programmes. Many of her study guides have been published. Leelo Kingisepp is a highly experienced teacher and teacher-trainer of Estonian as a second language; he has lectured extensively in this field at university level, and has also taught English and Finnish. Leelo Kingisepp is an established author of many titles aimed at providing guidance to second language teachers, and has written more in-depth Estonian coursebooks and textbooks. 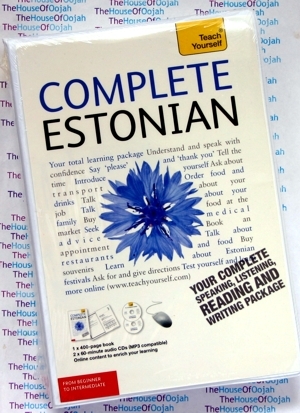 Estonian will likely be official language of Estonia, spoken by about 1.1 million people in Estonia and loads in a variety of émigré communities. It can be a Finno-Ugric language and it is closely related to Finnish. Estonian is one of the Finnic branch associated with the Finno-Ugric languages. Estonian is thus closely related to Finnish, spoken opposed to this associated with the Gulf of Finland, and is mostly of the languages of Europe which is not Indo-European. Despite some overlaps in to the vocabulary being a result borrowings, in the case of its origin, Estonian just is not related to its nearest neighbours, Swedish, Latvian and Russian, which can be all Indo-European languages. Estonian is distantly related to Hungarian (virtually any mutual intelligibility between the two). It will have been in line with Swedish, German (initially Middle Low German, later also standard German), Russian, and Latvian, even though it is simply not just related to them genetically.